Sweden was under the rule of Denmark until 1523, when King Gustav Vasa began to work toward liberating Sweden so that it could be an independent state. Today's flag, which was adopted in 1906, is an off-center yellow cross on a background of blue. The off-center cross is often called the "Scandinavian cross," and is taken from the flag of Denmark. Although the current flag wasn't instituted until just more than 100 years ago, it has been used in some form or another for about four centuries previously. It is thought that the flag's blue and yellow colors come from the national coat of arms, which originated in the 14th century. This coat of arms features three gold crowns on a blue field. 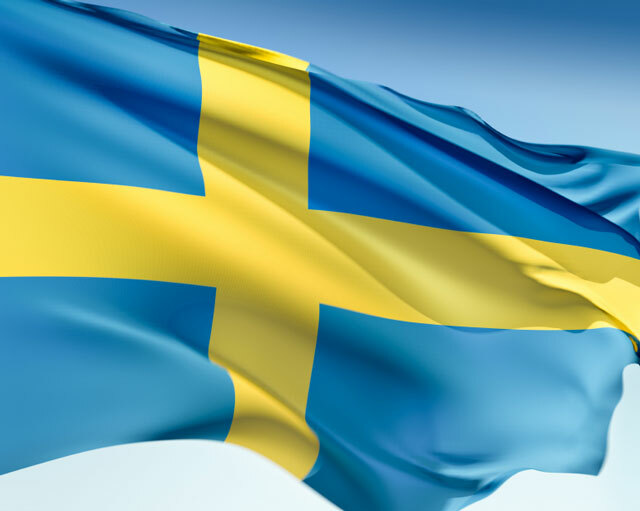 Today, Sweden's national flag day is celebrated on June 6, the same day that King Gustav Vasa, who was so integral to the country's independence, was elected in 1523. Sweden is located to the east of Norway on the Scandinavian peninsula, and is home to 8.8 million people. Its capital is Stockholm, and its language is Swedish. Sweden was under the rule of Denmark until 1523, when King Gustav Vasa began to work toward liberating Sweden so that it could be an independent state. Sweden, which joined the UN in 1946 and the EU in 1995, remained largely neutral in world conflicts until September 11, when attacks on the United States by terrorist contributed to the Swedes amending their stance to some degree. Sweden's landscape is mostly forested, and is dotted with numerous lakes. The climate is mostly continental, and because of the proximity of the Baltic Sea, the east cost tends to be colder than the western regions of the country. Summers are mild throughout the summer season. Sweden prides itself on an egalitarian society, in which the state provides an atmosphere that allows everyone to achieve economic dependence through work. In addition, Sweden also has one of the most complex welfare systems in the world. However, the large cost of this system caused major budget deficits in the late 1980s and early 1990s. Sweden's resources include minerals such as iron, copper, iron, and silver. However, other industrial sectors such as the automobile and technology industries make up a large part of the country's economy. Women make up a large part of the workforce — nearly half. In addition, the Swedish cabinet has one of the highest numbers of women in its cabinet of all European countries. While the nuclear family remains the focus of Sweden's society, marriage is on the decline while cohabitation is on the rise. Families in Sweden tend to be smaller than they are in other European countries, with families rarely having more than two children. Sweden is a popular tourist destination, and welcomes more than seven million visitors per year. Natural attractions include the mountains of the "midnight sun," the beaches that are located on the southern coast, and the vast and deserted countryside. The city of Stockholm is also a common destination. Gamla Stan, one of the city's most visited areas, is renowned for its stunning architecture and cobblestone streets, while those who enjoy museums can visit the Djurgarden area of the city. There are enough restaurants and eclectic shops to keep just about any visitor busy. 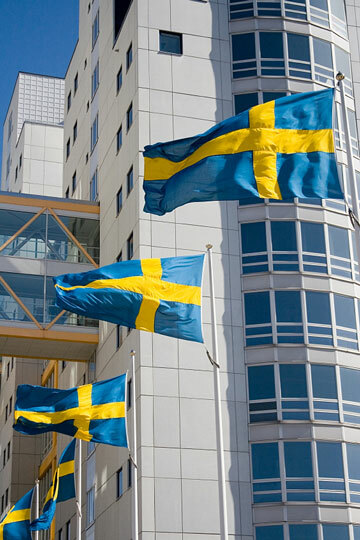 Sweden Facts - information about Sweden and its flag. Government of Sweden - official Swedish government website. Sweden Maps - maps of Sweden and Stockholm, Sweden's capital city.